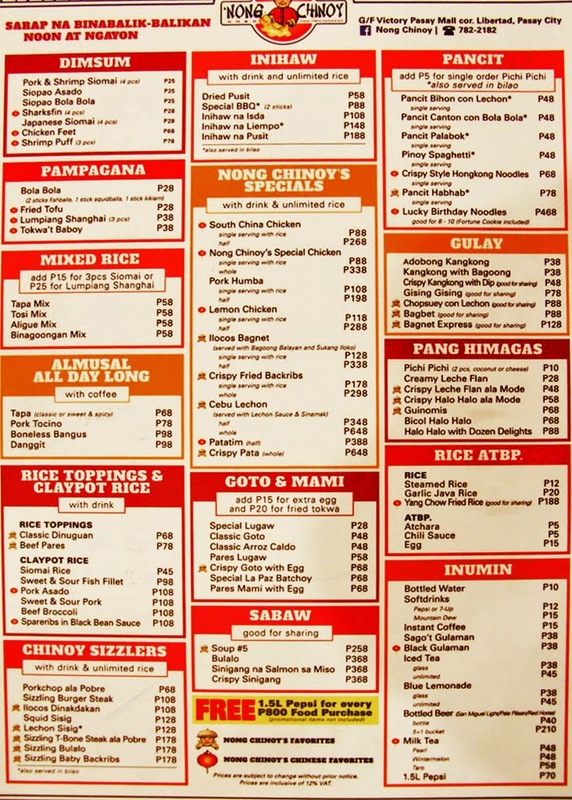 Nong Chinoy - Home of Various Chinese and Pinoy Delicacies! 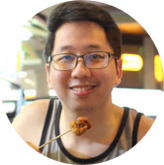 It had been almost two years since I started exploring the foodie world thru this blog, and I can't put into words how thankful I am for your continuous support! Anyway, just recently I was invited once more to try a food place called Nong Chinoy near LRT Libertad Station. Honestly, I was really reluctant to check the place out due to my unfamiliarity of the area, but I felt like I was obligated to explore that part of the metro. Hence, I accepted the invite and checked the restaurant out! 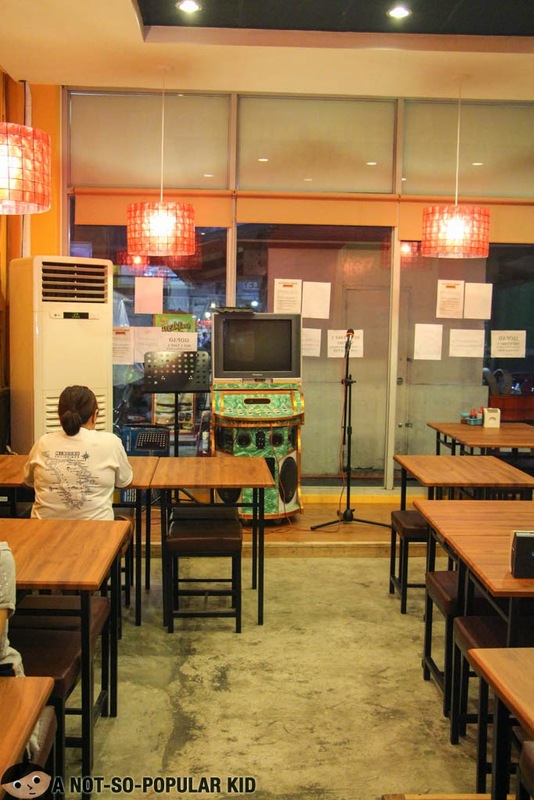 Karaoke Nights are possible here in Nong Chinoy! Nong Chinoy is a humble restaurant inside Victory Mall near the Libertad Station of LRT. It has a simple interior with dim lights. Seating capacity is just limited but may cater to about 30 to 50 people. The restaurant offers a well-diversified menu with food cuisine ranging from Chinese to Filipino (including various provincial delicacies). In order for you to have a clearer picture, why don't I share with you the photo of the menu? Frankly, I'm not really a fan of diverse menu because I easily get overwhelmed. Also, I prefer those places that specialize on a few but unique and amazing dishes. I don't know, but I really find that appealing. Now that you have an idea about Nong Chinoy, let' s now take a look at the food! 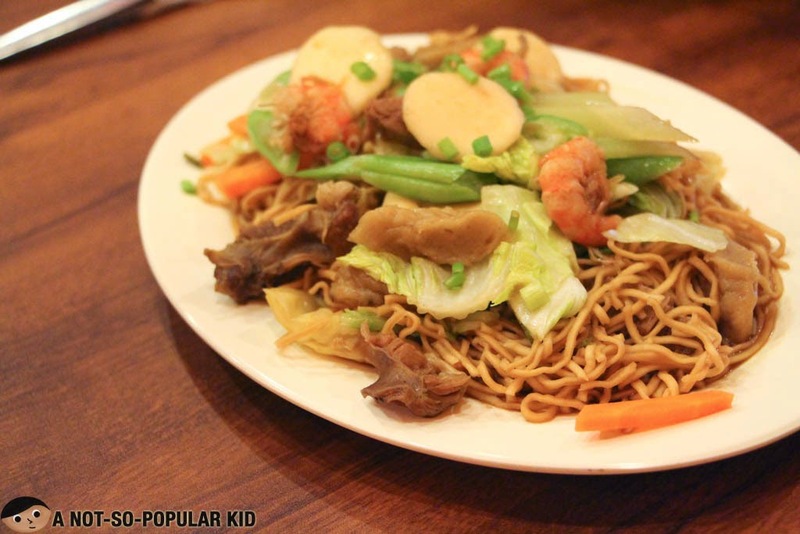 Served with an authentic sukang Iloco, this Pancit Habhab came in with bountiful meat and veggies. 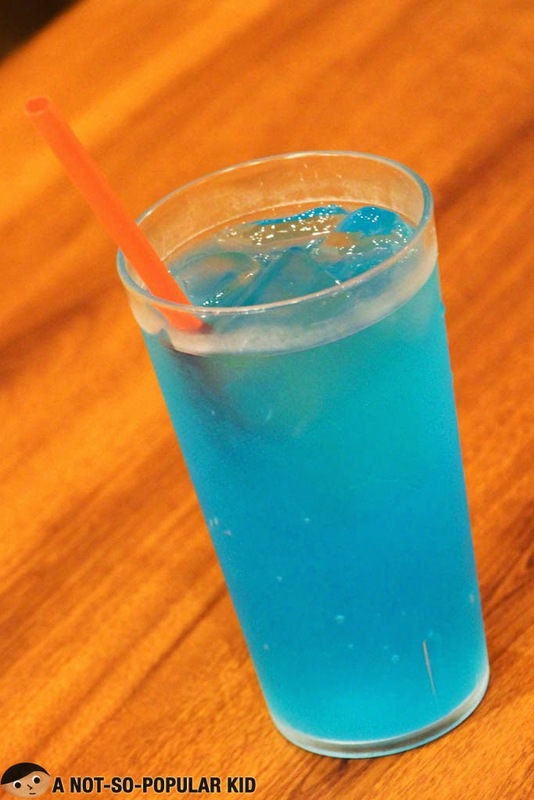 Considering the price, I would say that this is already "sulit" (although I found the taste somewhat near regular). Even though I wasn't able to appreciate the appearance of this bagnet (since it looked more like an ordinary liempo), I found the taste good enough. Plus, I find the two sauces that went with it interesting namely the sukang Iloco and the bagoong Balayan. 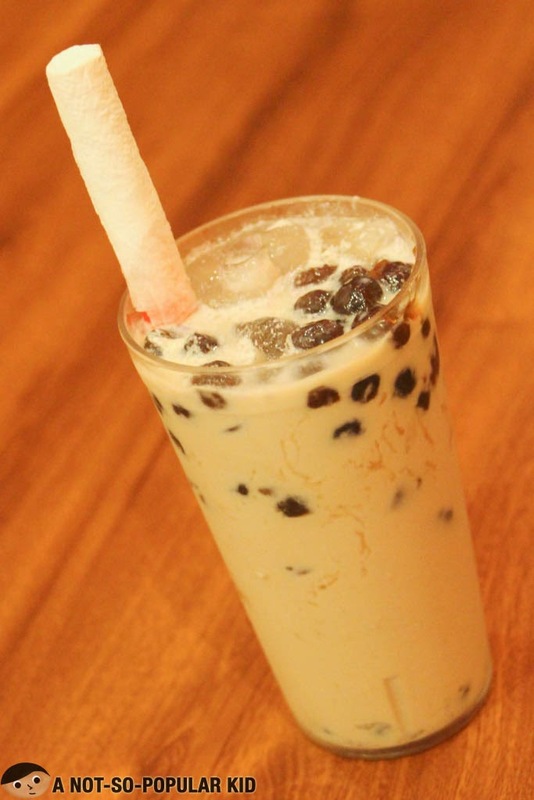 The drinks here in Nong Chinoy are simple and traditional; however, to go with the bandwagon, they are also serving some affordable milk teas! The Dinakdakan of Nong Chinoy is not the usual one that I'm familiar with. 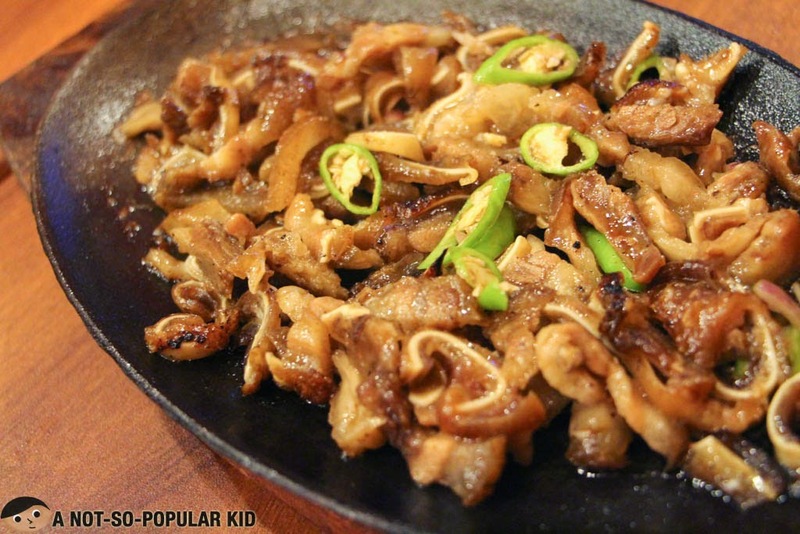 Instead of being diced, the sisig appeared as "strips". Anyway, the taste leaned more towards the regular sisig with slight creaminess coming from the mayonnaise, which I found interesting and nicely done! I call this a hybrid chicken because it tastes like Max's chicken and something else (i.e. has a mild lemon grass zest)! 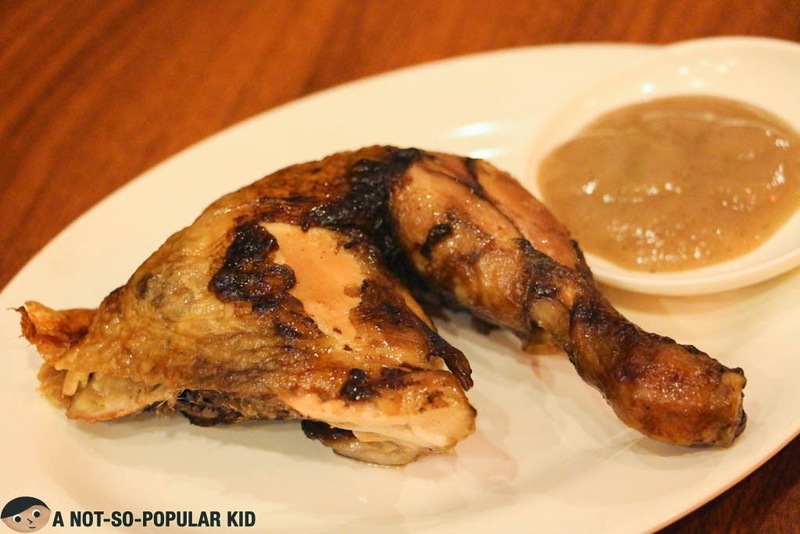 Also, it comes with 2 dips (banana catsup and liver sauce) for the flexibility of the taste. I would say that this is "sulit" because you only need to pay up P88 for this size of chicken, a drink and an unli rice. 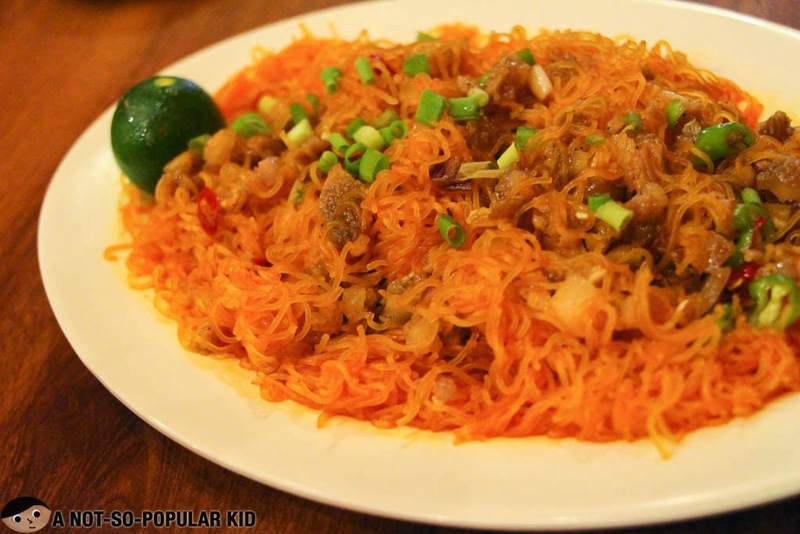 Nong Chinoy has been innovating Filipino dishes and recently came up with this creation - Pancit Sisig! Luckily, I got the honor of tasting the dish before the release, and I must say that it was really nice with its tasty potent flavor! However, you need to pair this up with something because it has an "umay factor". 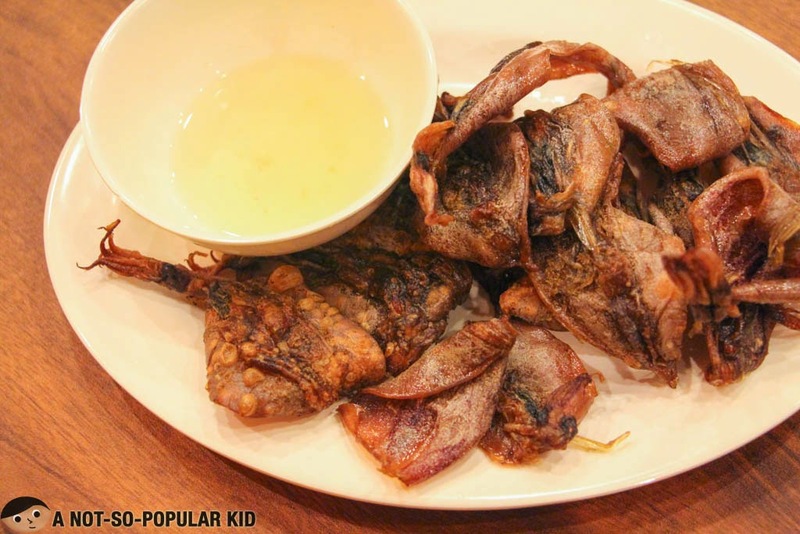 The surprisingly affordable meal - Dried Pusit dish! I have been craving for something different, so I decided to have this dried pusit - and I loved it! The squid was really tasty with prominence of saltiness (a natural effect of the drying process). Unfortunately, the squid was not crunchy the way I visualized it to be, but I didn't mind it that much. Alright, we've reached almost the end of the blog post, so here's the dessert I had - Crispy Leche Flan! 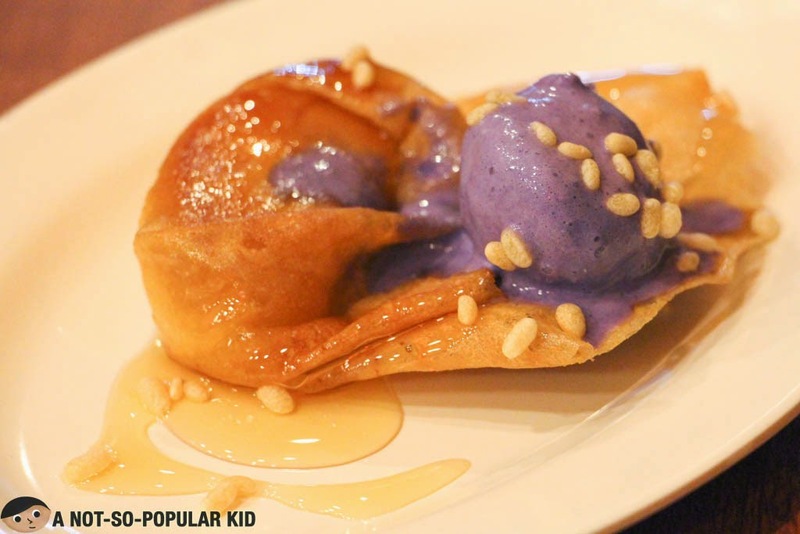 Interestingly, I found the dessert really lovely with its great blend of the sugar glaze, the leche flan and the ube ice cream! For the price of P48, I think it's a good dessert to order! 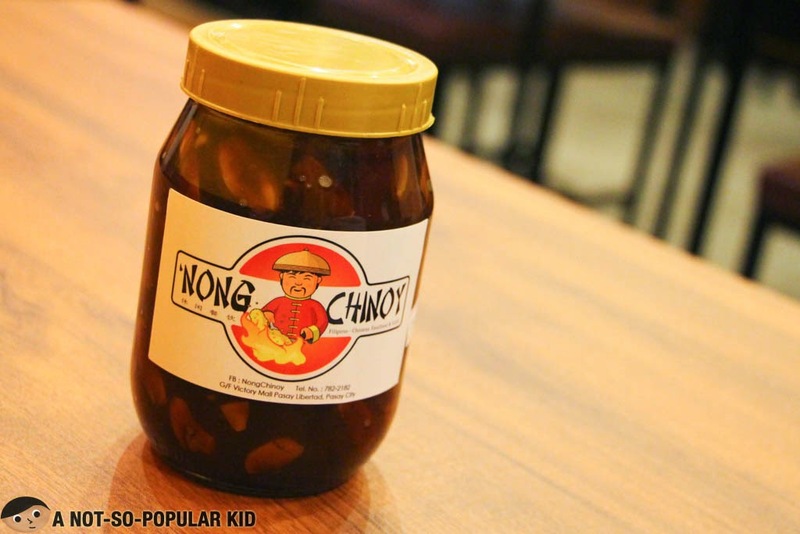 Surprisingly, Nong Chinoy also retails some special Filipino delicacies such as this Jam with Pili Nuts (to name one), sauces and more! I haven't tried this product yet, but I'll update this portion when I do! 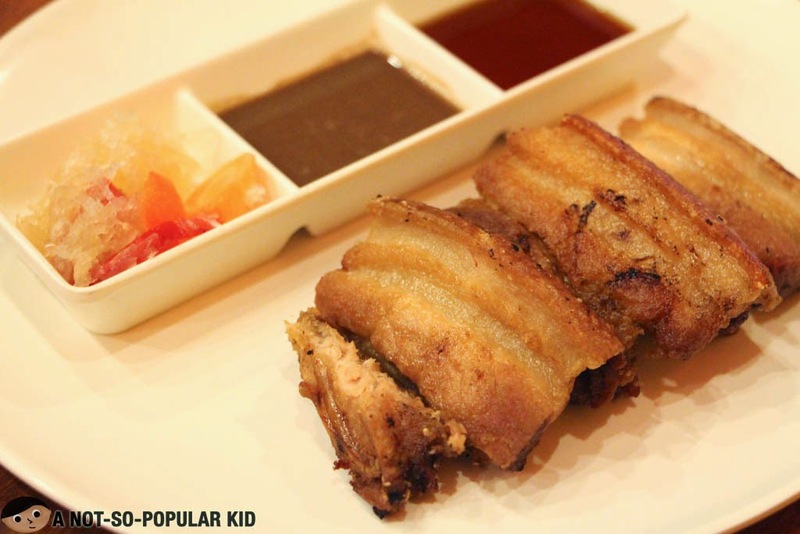 The dishes here in Nong Chinoy range from the ordinary ones to something one notch interesting, but considering the prices, you'll still find good value for your money. 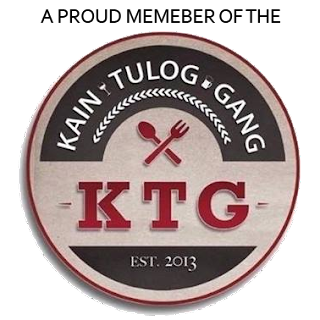 Again, although the food here is not extremely distinguished, it is sufficient enough to satisfy your cravings for various Filipino delicacies (in just one place)! I'm truly sorry to hear that happen, Ms. Rona, but I really appreciate you sharing this experience! It will help the readers of this blog! I was planning to buy their eat all you can promo online but I decided first to check if their restaurant has review to have an idea of the place and the food. This is really a very informative review. Thanks. But decided not to pursue buying due to the comment below. Since una palang I was having doubt na dahil mura tlga xa, at kapag mura usually, di nakakasatisfy. You are very much welcome Relch! Thanks for dropping by and providing your insight! woaw, buti nalang nag search muna ko regarding Nong Chinoy >.< Thanks for the info! You're welcome Grace! I am happy that you found this post useful! Awwww so sad naman, supposedly today I will buy the voucher in Metrodeal and try. Thanks for the info. Hope someone will post positive about this resto so I will be convince to try. Can I ask you, is it real they offer buffet here? Yes. I was able to talk to the owner, and they are really having a buffet promo there. CLOSED na pala ang Nong Chinoy?? kelan pa? Anyway, SAAN pwede magpa REFUND ng paid stubs/tickets ng Weekend Buffet? Saan po pwede magpa REFUND ng paid stubs/tickets ng Nong Chinoy for Weekend Buffet?? Penge na rin po ng EXISTING-contact numbers nila para hindi naman masayang oras ko bago ako pumunta dun. CLOSED na pala ito. Thanks for the infos guys.